Neutron ray was measured in Tokyo. Before 311, average neutron ray was 4 nSv/h. After 311, it’s 464 nSv/h (116 times higher than before 311). Neutron ray is emitted from Uranium 235. 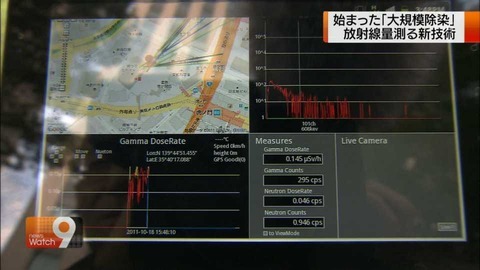 In one of the worst hot spots in Chiba, Kashiwa shi, citizens detected Uranium 235. It was right beside a bench in Matsuba daiichi kinrin park. In Kashiwa, even from the height of 1.2, they can measure Uranium 235. They are all scattered on the ground and they all emit neutron ray. Neutron ray can not be measured by most of the Geiger counters. and it’s way more harmful to human body. This is why I warned that dosimeters makes you blind. There have been a lot of the cases such as nosebleed, fatigue (bura bura disease), immune trouble etc.. They have been labelled as “harmful rumor” because “air dose” is too law to cause those symptoms. However, this measurement of neutron rays makes everything clear. Fear is always in the blind spot. Now Uranium 235 is all around in Tokyo, which came from MOX with Plutonium. They keep emitting neutron ray. Have you any readings from CA, WA, or OR? If it is that bad over there, it must be here as well. Since you are the only site staying on this important story, I am hoping you have some information about the atmosphere, soil & water in Northern America. I read that Japan is offering 50,000 free trips to their country to attract some of the tourist trade they have lost thanks to the nuclear fallout. 50K free visits, but I am sure they want something in writing saying how great it is in Japan. It sounds like something our leaders would cook up……pathetic. Thanks for staying on this important story! Now that I have decent Internet service once again, I will be visiting your site for news & information.